Prize: 8 Grand Prizes $1,000 Jean Coutu gift card, 250- $50 Jean Coutu gift cards. 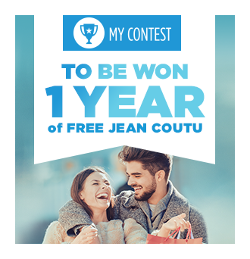 What you must do to enter: To enter the contest, you must sign up for the Jean Coutu Newsletter by completing the registration form All Entrants who have registered their AIR MILES collector number in their profile will be eligible for the draw for secondary prizes. Statistics: This contest was opened by 47 and entered by 4 ContestChest.com members. 9% of those who opened the contest, entered it.